Bradley never talked about Iwo Jima, refusing interviews his entire life, except one in 1985, which his wife encouraged. Upon Bradley’s death in 1994, his son James embarked on a four year journey to research the event and men involved. His efforts resulted in the New York Times Best Seller Flags of Our Fathers, of which Clint Eastwood made into a movie in 2006. In late 2014, history enthusiast and Marine World War II memorabilia collector, Eric Krelle, proposed questions regarding Bradley’s identity following an intense study of the pictures of the two flag raisings. Furthermore, he repositioned Sousley. Initially, historians rejected his findings. However, the Marine Corps performed their own study and on June 23, 2016, verified Krelle’s conclusions were correct. A fact James Bradley also accepted, now believing his father confused the day’s events and the photos. Liberty, war is not a glorious or desired circumstance. However, sometimes it is necessary. Many want to believe that if America would just capitulate to our enemies, they would accept us and peace would follow. However, this line of thinking, no matter how great it sounds, defies reality. The truth is evil exists in this world. It has since Adam and Eve ate from the tree and it will exist until Christ returns. (see Fruit of the Forbidden Tree) That is just a fact. God does not desire war, as Christ declared by preaching love and respect. Yet, He also authorizes the government to defend the country when evil reaches its borders. Therefore, we should always respect and thank all our armed forces personnel, who risk their lives to defeat our enemies so we can live peacefully. Joe Rosenthal snapped the photo that became so iconic that it’s now etched in marble. However, the story begins with Leatherneck photographer, Louis Lowery, who captured the moment Harold G. Schrier planted the makeshift flagpole made from an iron water pipe into the ground as Ernest “Boots” Thomas and Henry “Hank” Hansen assisted. Once in place, fellow Marines on the shore and docked ships, as well as other servicemen, began a chorus of cheers, shouts and horn blasts. The loud celebration aroused the dormant Japanese hiding quietly in caves and underground tunnels, prompting their immediate response. As the Marines quickly thwarted their attack, the site of Old Glory not only alerted the Japanese to their eminent defeat on Iwo Jima, it signaled a change in the entire Pacific War. As the war in the European Theater started drawing to a close, Allied Forces began turning their attention towards Japan. As an island, Japan benefited from a built in defense, of which the volcanic island of Iwo Jima played an important role. The United States military occupied the Mariana Islands, where they stationed long-range bombers. However, bombers headed to the mainland were easily spotted by personnel on the island which sat between the U.S. bases and Japan. Warnings radioed to the mainland prevented any surprise attacks from the American bombers. Therefore, military leaders devised plans to conquer Iwo Jima and Okinawa, another major Japanese island, so as to open the way to invading the mainland. In addition, already established airfields would lend American fighters and bombers a closer airfield for future raids as well as emergency landing sites. Understanding the importance of the strategic island, the Japanese anticipated an American attack for months. As they waited, they also prepared. In addition to the natural caves on the island, soldiers prepared dugouts and a complete underground installation, which included an elaborate tunnel system. Therefore, when the United States Marines landed on the island on February 19, 1945, they were primarily fighting an enemy they could not see as bullets appeared from out of thin air and ripped through Marines. A bloody deadly battle ensued for days as Japanese traveled and hid throughout the land, stealthily attacking their enemy from protected cocoons. On the other hand, their confined enclosed spaces became inevitable tombs as the Marines responded with grenades and other explosive artillery, or the devastating M2 flamethrower. Convinced by their leaders that Americans were heartless savages, Japanese who didn’t die immediately chose to hide in the caves and tunnels for days as they slowly died, fearing to surrender. Others took their own life believing it would be better than facing the Americans. However, the handful that eventually gave up experienced compassion and humanity from the Americans and were taken care of. Sensing that the island was soon to be theirs and looking for a show of victory, Lieutenant Colonel Chandler Johnson sent a platoon of his 2nd Battalion, 28th Marine Regiment up the volcano to conquer and take control of it on February 23, 1945. 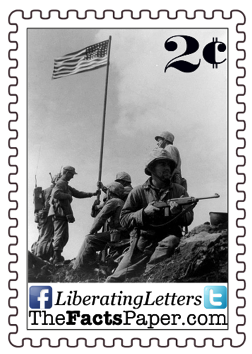 After the Marines easily took Mount Suribachi, several men raised a small American flag on an abandoned water pipe to signify its capture. Along with Schrier, Thomas, and Hansen, who were mentioned earlier, Raymond Jacobs, John Bradley, James Michels and Charles W. Lindberg helped raise the flag. Michael Strank was ordered to take a few men up Mount Suribachi to replace the flag with the one Rene Gagnon was bringing. Strank and Gagnon were joined by Ira Hayes, Harold Schultz, Franklin Sousley and Harlon Block. As the men raised the new larger flag, Associated Press photographer Joe Rosenthal snapped a photo as Sergeant Bill Genaust stood shoulder-to-shoulder with him capturing the event on motion picture. Rosenthal sent his film off to an AP editor who forwarded it to New York where hundreds of newspapers picked it up in less than 18 hours of its shooting. Many accused Rosenthal of posing his Pulitzer Prize winning photo, the only photograph to win the honor in the year it was taken. However, Genaust’s motion film proves it was not posed, but a spontaneous photo of the historic event. The marines celebrated taking the island, but not the Japanese fighting spirit. 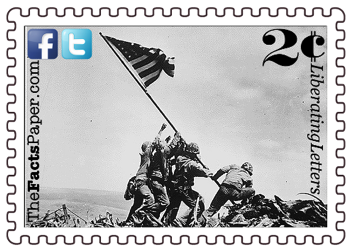 Knowing how vital Iwo Jima was to Japan’s defense, the site of the U.S. Flag was not only a physical defeat to the Japanese, it was a devastating blow to their morale. But the Japanese continued to battle from their hidden fronts, even as their defeat was inevitable. Within days Block, Strank and Hansen were dead while a Japanese sniper killed Sousley on March 21. Fighting officially ended on March 26. After the dust settled, almost all of the 22,000 Japanese defending the island were either killed, wounded or died by suicide. However, American Marine casualties surpassed that number by 4,000, with deaths reaching 6,800. At the time of the photograph, the United States was preparing for their Seventh War Loan Drive. Upon seeing the picture, President Franklin D. Roosevelt requested the soldiers’ identities, realizing the publicity opportunity it provided. Gagnon misidentified two men, Block and Schultz as Hansen and Bradley, respectively, who participated in the first flag raising 90 minutes earlier and were still on the mountain. Gagnon originally refused to name Hayes, as Hayes advised him not to, yet relented under the threat of being charged with disobeying an order from the President. The survivors were invited to the White House to meet with Roosevelt. However, FDR died before their arrival. Instead President Harry S. Truman received them on April 20. They soon embarked on a bond tour beginning May 11 and ending July 4. Hayes, a Prima Native American, likely suffered from PTSD or survivor’s guilt, as he began drinking on the tour. As a result, he was ordered to return to his former unit in Hawaii. However, after arriving in Washington D.C., he realized the Block/Hansen identification error. Trying to correct the mistake, he informed authorities, but was told to remain quiet as the identities had already been published. Following the war, Hayes hitchhiked to Texas to share Block’s participation in the event to his parents. Thanks to his efforts, the correction was made in 1947. Unfortunately, his alcoholism continued to worsen, causing his death on January 24, 1955. Rosenthal’s picture, known as “Raising the Flag on Iwo Jima,” inspired the U.S. Marine Corps War Memorial. Also known as the Iwo Jima Memorial, the monument is located near the Ord-Weitzel Gate of the Arlington National Cemetery. Dedicated in 1954, the sculptor used Hayes, Gagnon and Bradley as models while relying on photographs for Strank, Sousley and Block.